Cyberbullying, the act of using the Internet to harass a targeted person, is perhaps the most devastating kind of bullying children experience these days. Often cloaked in anonymity, the posted comments can be vicious. And since most kids are online, a nasty remark travels far and as fast as the click of the “send” key. Meanness goes viral. 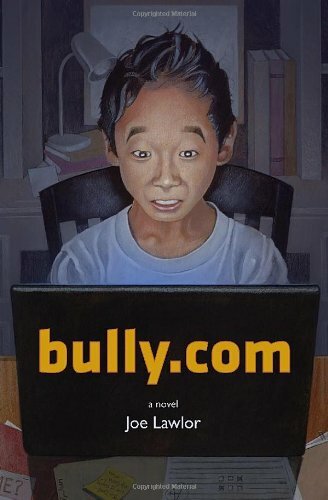 In bully.com by Joe Lawlor, the school’s computer nerd Jun Li gets accused of posting inappropriate photos of a girl with a secret eating disorder. The principal gives Jun only seven days to find the real culprit in order to prove his innocence or he will be expelled. Jun may be a whiz on computers, but he is clueless when it comes to dealing with people. At first, he bumbles the investigation. But with the help of his best friend Chris, he gets bolder. With the deadline looming, he eventually discovers the evildoer, whose identity shocks the whole school: The author is a middle school teacher. It’s refreshing that the main character of a book for youth is Asian. As well, Jun’s best friend Chris is a girl, a basketball jock whose imposing height and in-your-face personality compensates for Jun’s awkwardness and shyness—a nice bit of gender role reversal. The book brings up two subjects, common but difficult to discuss: bulimia and suicide. Typically, Jun Li keeps his problems to himself because he doesn’t want his parents meddling, though is parents do back him up at his moment of crisis. Given the high levels of stress children face in today’s school environment, it’s highly likely there will be youth reading this book who are suffering from an eating disorder, or perhaps suicidal thoughts engendered by from bullying, who could be helped if persuaded to confide in a sympathetic adult—largely absent in this story. One wishes Mr. Lawlor had weaved a bit of perspective into the text or had provided a footnote or two for those seeking further information or help. Otherwise, bully.com is full of suspense with a surprise ending skillfully written to keep readers hanging on every word.